A Price List is a collection of billing items representing all the billable goods and services your winery provides; think of it as a menu in a restaurant – a list of dishes and their prices. Many wineries have only one price list; some have one per vintage year and others have price lists built around wine-stage programs (for custom crush/AP) or wholesale vs retail. The simplest and most straightforward is one that lists ALL billing items and their default prices. Once your items are established use the New Price List… option to set the default prices and any advanced options for your items. Default Tax Rate [?] – nominate an appropriate tax rate that will apply to any items linked to this Price List and that are also set as Taxable. See the Item setup below for more details on the Tax state. Currency Code – Use the drop down list to select the currency units to be billed and in which you expect to be paid. Use the local link to automatically select your local currency type. Payment Terms – Enter the numbers of days and then use the drop down list to select the terms. Price ($) – the price Using your currency code) that you want to charge for this item on this Price List. Keep in mind it might be multiplied depending on the Item’s Charge Type. Minimum price ($) – set the minimum allowable price for this item. If the calculated value is lower than this amount then the Minimum price will be used instead. 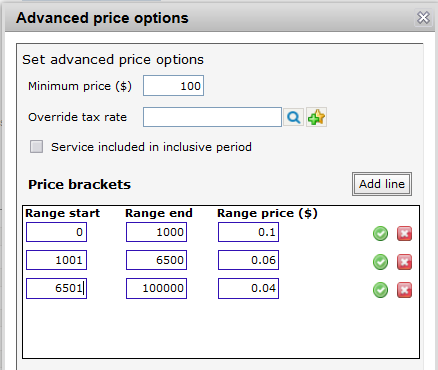 Price Brackets – This is also known as “tier pricing”. 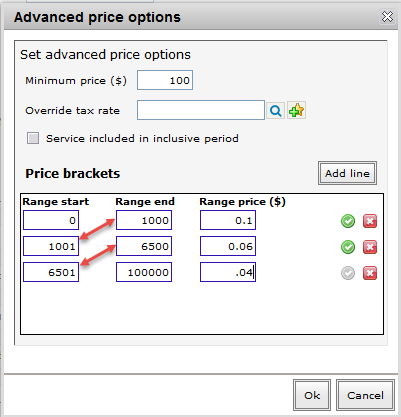 Define configurable ranges for prices using brackets. Set a start and end range value based on the multiplier that corresponds to the Item’s Charge Type. For example an Item configured for Cross Flow Filtration with a Volumetric Charge Type may have a range of 0 – 1000 L with a price of $100 and a decreasing scale from there based on higher volumes. You may additional “tiers” by using Add line. Save your Advanced properties. Note: Generally, the range start for each tier is one higher than the range end for the previous tier. Inactive to temporarily exclude a price from the Price List you can use the Inactive flag. To remove it all together just use the red cross. 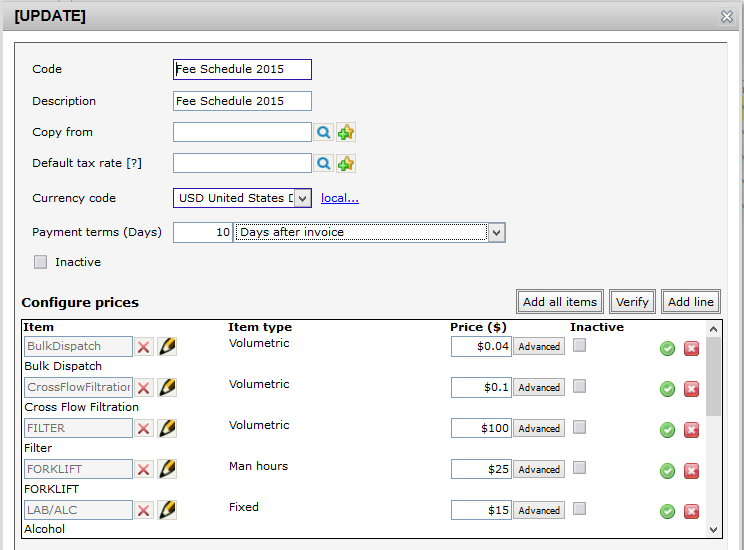 Once your price list(s) are set up, you will use them to configure your Service orders.